In religious or mythological cosmology, the seven heavens refer to seven layers of the sky. These were associated in ancient times both with the metaphysical realms of deities and with observed celestial bodies such as the classical planets and fixed stars. The concept, derived from ancient Mesopotamian religions, can be found in the Abrahamic religions such as Islam, Judaism and Christianity; a similar concept is also found in some Indian religions such as Hinduism. Some of these traditions, including Jainism, also have a concept of seven earths or seven underworlds or may be seven climate zones. The number seven corresponds to the seven classical planets known to antiquity. Ancient observers noticed that these objects moved at different paces in the sky both from each other and from the fixed stars beyond them: Mercury, Venus, the Moon, the Sun, Mars, Jupiter, and Saturn. Unlike comets, which appeared in the sky with no warning, they did move in regular patterns that could be predicted. They also observed that objects in the sky influenced objects on earth, as when movements of the sun affect the behavior of plants or movements of the moon affect ocean tides. Others believe the seven heavens are located to seven stars of the big dipper, according to ancient western astrology. Observations like these led to the development of geocentric cosmologies: earth-centered ideas about the structure of the universe. In some cultures the layers, or "heavens", in the sky were understood as vast spheres. Each rotated around the earth at its own pace, taking its associated point of light, and any associated heavenly beings, along. Speculation spread about the effect all celestial objects--not only the sun and moon, but other points of light such as Mars, Jupiter, and fixed stars--might exercise over earthly events. Stories and symbolic associations followed. The understanding that the heavens can influence things on earth lent heavenly, magical properties to the number seven itself, as in stories of seven demons, seven churches, seven spirits, or seven thrones. The number seven appears frequently in Babylonian magical rituals. The seven Jewish and the seven Islamic heavens may have had their origin in Babylonian astronomy. In general, heaven is not a place for humans in Mesopotamian religion. As Gilgamesh says to his friend Enkidu, in the Epic of Gilgamesh: "Who can go up to heaven, my friend? Only the gods dwell with Shamash forever". Along with the idea of seven heavens, the idea of three heavens was also common in ancient Mesopotamia. "Heaven in Islam" redirects here. For the final abode of the righteous in Islam, see Jannah. A Persian miniature from The History of Mohammed depicting seven heavens. The Qur'an and Hadith frequently mention the existence of seven samāwāt (سماوات), the plural of samāʾ (سماء), meaning 'heaven, sky, celestial sphere', and cognate with Hebrew shamāyim (שמים). Some of the verses in the Qur'an mentioning the samaawat  are Quran 41:12, Quran 65:12 and Quran 71:15. There are two interpretations of using the number "seven". One viewpoint is that the number "seven" here simply means "many" and is not to be taken literally (the number is often used to imply that in the Arabic language). But many other commentators use the number literally. In other sources, the concept is presented in metaphorical terms. 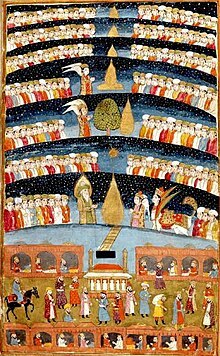 Each of the seven heavens is depicted as being composed of a different material, and Islamic prophets are resident in each. The first heaven is described as being made of water and is the home of Adam and Eve, as well as the angels of each star. The second heaven is described as being made of white pearls and is the home of Yahya (John the Baptist) and Isa (Jesus). The third heaven is described as being made of iron (alternatively pearls or other dazzling stones); Joseph and the Angel of Death (named Azrael in some traditions) are resident there. The fourth heaven is described as being made of brass (alternatively white gold); Idris (conventionally identified with Enoch) and the "Angel of Tears" resides there. The fifth heaven is described as being made of silver; Aaron and the "Avenging Angel"[disambiguation needed] hold court over this heaven. The sixth heaven is described as being composed of gold (alternatively garnets and rubies); Moses can be found here. The seventh heaven, which borrows some concepts from its Jewish counterpart, is depicted as being composed of divine light incomprehensible to the mortal man (alternatively emerald). Abraham is a resident there  and Sidrat al-Muntaha, a large enigmatic Lote tree, marks the end of the seventh heaven and the utmost extremity for all of God's creatures and heavenly knowledge. Araboth (ערבות), The seventh Heaven where ofanim, the seraphim, and the hayyoth and the throne of the Lord are located. The description is usually taken as an oblique reference by the author to himself. The passage appears to reflect first-century beliefs among Jews and Christians that the realm of Paradise existed in a different heaven than the highest one--an impression that may find support in the original Greek wording (closer to "caught away" than "caught up"). In the second century, Irenaeus also knows seven heavens (see his Demonstration of Apostolic Preaching 9; cf. Against Heresies 1.5.2). Over the course of the middle ages Christian thinkers expanded the ancient Mesopotamian seven-heaven model into a system of ten heavens. This cosmology, taught in the first European universities by the Scholastics, reached its supreme literary expression in The Divine Comedy by Dante Aligheri. The Second Book of Enoch, also written in the first century CE, describes the mystical ascent of the patriarch Enoch through a hierarchy of Ten Heavens. Enoch passes through the Garden of Eden in the Third Heaven on his way to meet the Lord face-to-face in the Tenth (chapter 22). Along the way he encounters vividly described populations of angels who torment wrongdoers; he sees homes, olive oil, and flowers. The book's depiction of ten heavens represented an expansion of the ancient seven-heaven model. This expanded cosmology was developed further in medieval Christianity. According to some Puranas, the Brahmanda is divided into fourteen worlds. Among these worlds, seven are upper worlds which constitute of Bhuloka (the Earth), Bhuvarloka, Svarloka, Maharloka, Janarloka, Tapoloka and Satyaloka, and seven are lower worlds which constitute of Atala, Vitala, Sutala, Talatala, Mahatala, Rasatala and Patala. 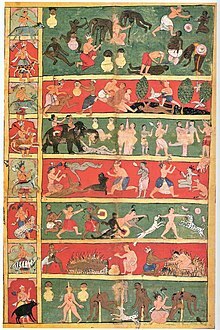 A cloth painting depicting seven levels of Jain hell. Left panel depicts the demi-god and his animal vehicle presiding over each hell. According to Jain cosmology, there are seven levels of Naraka or hell. These are further divided into 8,400,000 other hellish locations. Inanna visited the Sumerian seven-gated underworld. ^ a b c Hetherington, Norriss S. (2014) [1st. pub. 1993]. Encyclopedia of Cosmology (Routledge Revivals) : Historical, Philosophical, and Scientific Foundations of Modern Cosmology. Routledge. pp. 267, 401. ISBN 1-306-58055-2. Retrieved 3 June 2015. ^ Campbell, Robert. "Aristotle's 'On the Heavens'". Ancient History Encyclopaedia. ^ Barnard, Jody A. (2012). The Mysticism of Hebrews: Exploring the Role of Jewish Apocalyptic Mysticism in the Epistle to the Hebrews. Mohr Siebeck. p. 62. ISBN 3-16-151881-0. Retrieved 3 June 2015. ^ "Sumerian Words And Their English Translation". History World. Retrieved 2 June 2015. ^ Horowitz, Wayne (1998). Mesopotamian Cosmic Geography. Eisenbrauns. p. 208. ISBN 0-931464-99-4. Retrieved 3 June 2015. ^ Collins, Adela Yarbro (2000). Cosmology and Eschatology in Jewish and Christian Apoocalypticism. Brill. ISBN 90-04-11927-2. ^ Lange, Armin; Tov, Emanuel; Weigold, Matthias (2011). The Dead Sea Scrolls in Context: Integrating the Dead Sea Scrolls in the Study of Ancient Texts, Languages, and Cultures. Leiden: Brill. p. 808. ISBN 90-04-18903-3. Retrieved 3 June 2015. ^ Peter D'Epiro & Mary Desmond Pinkowish (1998). What Are the Seven Wonders of the World? And 100 Other Great Cultural Lists: Fully Explained. Doubleday. pp. 219–220. ISBN 0-385-49062-3. ^ Hotel and Restaurant Employee's International Alliance & Bartenders' International League of America (1918). Mixer and Server. 27. p. 51. ^ "Angelology". Jewish Encyclopedia. Retrieved 16 June 2015. ^ Scholem, Gershom (1965). Jewish Gnosticism, Merkabah Mysticism, and the Talmudic Tradition. New York: Jewish Theological Seminary of America. OCLC 635020. ^ E. W. Bullinger A Critical Lexicon and Concordance to the English and Greek "2, 14, To this "Third heaven" and "Paradise" Paul was caught away, 2 Cor. xii. 2, 4, (not "up", see under "catch") in "visions and revelations of the Lord", 2 Cor. xii. 1. One catching away—with a double revelation of the New heaven and the..."
^ Edward Langton (11 July 2014). Good and Evil Spirits: A Study of the Jewish and Christian Doctrine, Its Origin and Development. Wipf and Stock Publishers. pp. 248–. ISBN 978-1-62564-991-1. ^ Dalal, Roshan (2010). Hinduism:An Alphabetical Guide. Penguin Books. p. 224. ISBN 0-14-341421-6. ^ Jansma, Rudi; Jain, Sneh Rani (2006). Introduction to Jainism. Prakrit Bharti Academy. ISBN 81-89698-09-5. Davidson, Gustav. Dictionary of Angels: Including the Fallen Angels. New York: The Free Press, 1967 (reprinted 1994). ISBN 0-02-907052-X. Ginzberg, Louis. Henrietta Szold (trans.). The Legends of the Jews. Philadelphia: The Jewish Publication Society of America, 1909–1938. ISBN 0-8018-5890-9. This page was last edited on 2 April 2019, at 15:58 (UTC).